While other methods involve painful shocks to keep your dog within set boundaries, San Antonio Dog Fence uses a different method – the GentleSteps™ method. This is a brilliant new training method that combines our advanced technology with a humane training technique that keeps your pet contained without painful zaps. This training is extremely gentle and uses low levels of correction and positive reinforcement. Not only do pets learn boundaries faster with GentleSteps™, but the training is often also fun. The end result is a happier, healthier, safely contained pet! Our technologically advanced products are only half of what makes a Pet Stop® underground fence system so effective at keeping pets safely contained. 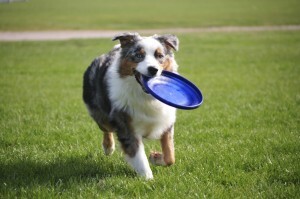 The other half is just as important – training your pet. For the fence system to be effective, it’s critical that your pet learn and remember their new fence boundaries. Avoiding negative association is far easier with the low fence levels introduced with GentleSteps™. This effective, new training method needed an equally unique training tool, and the Pet Stop® design team was ready for the challenge. By utilizing the most advanced pet fencing system available, you and your Pet Stop Professional will determine the right amount of soft touch required to have your dog learning their new boundaries quickly, and most important, happily. After your dog is comfortable with their new fence, you can choose from higher levels to help your dog resist the many natural distractions that might tempt them to leave the safety of the yard, such as squirrels, bikes and running children. How Long will GentleSteps™ Training take? Just like us, each individual pet’s personality and learning curve are different and the pet fencing experts at San Antonio Dog Fence will customize the training experience to what best suits your pet and provide the initial fence training to get you started. Most pets are trained to the fence in less than 2 weeks, and if your pet requires follow-up training, we will assist you. Contact San Antonio Dog Fence today to learn more about our GentleSteps™ training. Contact Us with any other questions you may have.